This interview was published in the news letter of the Belgian Embassy in Kuala Lumpur. Hello Edith, how did you end up in Malaysia? Well, 5 years ago I first experienced teaching abroad. I loved the fact that I could combine my two passions: teaching and travelling. Before moving to Malaysia, I lived in Zimbabwe and Burundi. Both were amazing experiences! After working in Belgium for a while, which was fulfilling too, I decided I wanted to go and explore life in another country again. I am young and have no children (yet), so now is the time, I thought! I started applying for schools all over the world. The school in Kuala Lumpur was my first choice, because I would be part of a team. Most Dutch schools are small and require only one teacher. In Kuala Lumpur, we are a strong team of 4-6 teachers, which means a lot more learning opportunities for me. Before moving, I didn’t know much about Malaysia. It was thrilling and scary at the same time. But now, 2 years later, I’m so happy I came and I’m grateful for all the experiences that Malaysia (and Asia) brought me so far. Looking forward to what comes next! As a teacher, what inspires you most? The children! In this setting, you meet children that are often raised bilingual or multilingual and come into contact with many different cultures. Some of them were born abroad and have never lived in Belgium or the Netherlands. Others only move abroad for a few years with their families. They are worldly and wise and I learn a lot from them! As you can imagine, the different backgrounds makes the differences between these children equally big. This a challenge but mostly a rewarding one! During the day, our students go to an international school, where they speak English or French. They are not surrounded by the Dutch language all day long and that affects them, off course. So once a week, they come for Dutch lessons and they spend time with other Dutch speakers. I admire them for their efforts and respect the fact that they try their best, even after already spending a whole day at school! It inspires me to make the lessons as fun as possible! As a teacher, it is rewarding to see these kids grow and know it will be easier for them, when/if they move back to Belgium or the Netherlands. 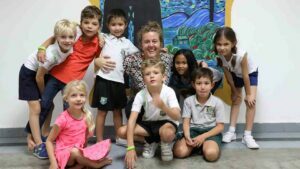 LanguageOne Kuala Lumpur offers Dutch lessons to kids with a Belgian or Dutch passport. Once a week, the students come to M’KIS, where they learn with kids of the same age. LanguageOne follows a curriculum, that is inspired by both the international and Dutch/Belgian guidelines of education. The lessons help them to develop their knowledge of the Dutch language and culture. We have limited time and a lot of content to teach, but luckily the parents understand this and help their kids with homework. We try to fit all the language related content of one school week in Belgium, into a lesson of 2.5 hours! Off course we pick out what’s most relevant and useful. We make it fun and learn from each other.